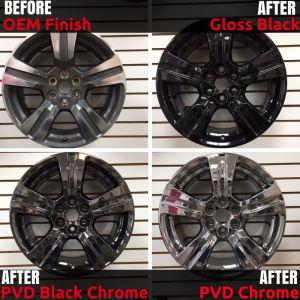 We offer total-service powder coating for your wheels and rims. Powder coating your wheels offers a high-quality and durable finish that protects your wheels and rims from the elements and road hazards. Powder coatings do not chip, fade, or crack. This makes them great for withstanding dirt, scratches, dust, abrasions, and heat. Painting the entire face of an alloy wheel to change from the original finish. This includes standard colors such as silver, black, white, matte, semi-matte, gloss. etc. Powder Coating your wheels is affordable option that is also extremely durable and long-lasting. Price: $125.00-$145.00 depending on style of powder coating.